Selling to customers in the morning, Hermon delivered in the afternoon. 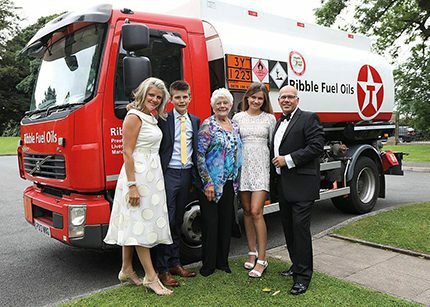 Assisted by his wife Andrea, Hermon’s hands-on business approach saw the business grow steadily and in 1984 Ribble Fuel Oils moved to a purpose-built depot at Walton Summit in Preston. To find out more about the business 50 years on, Fuel Oil News editor Jane Hughes met with Hermon’s son David, who was just a babe in arms when the business began back in 1967. David’s late father spent just under 28 years in the business. Having joined in 1985, David already has 32 years under his belt. Brother Ian joined the business in 1988 and in 2005 the brothers set up Complete Tank Solutions. In 2011 Ian took over the tank business with David buying Ian’s share of the fuel business. “Whilst my father would recognise the Texaco and Shell brands, there are now so many names in the industry that would be completely unknown to him. 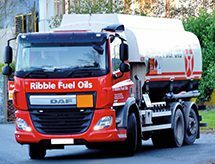 Whilst the successful business built up by David and Ian’s parents was very much focused on domestic fuel, other strings and five acquisitions have been added to Ribble’s bow in more recent times. With its fuel card and Broughton Lubricants divisions, today’s company is pleased not to be solely reliant on weather-dependant domestic business. Between three and four hundred thousand litres of lubricants are stocked in a large warehouse on the Walton Summit site. Being based in the heart of the industrial North, lubricants made perfect sense. Broughton Lubricants is one of Castrol’s largest UK distributors and, as the only Castrol Ambassador Distributor for the industrial and automotive product range, the company has attended all Castrol’s conferences over the last 10 years; an accolade only shared with 5 other global Castrol distributors. With reps across the country, Broughton supplies industrial lubricants across the UK. “Our philosophy is that if you don’t stock it, you can’t sell it, and over the past four or five years the business has grown by over 20% year on year. “Fuels is a much faster business in which we have no control of the product price or the weather,” said David. “You prepare a budget and by the time you press print, everything’s changed. The price goes up and down we just adapt and get on with it. The pricing strategy is far more complex – spot, fixed, forward etc – with suppliers wanting volume predictions in advance – but how do you forecast if it will be cold…? 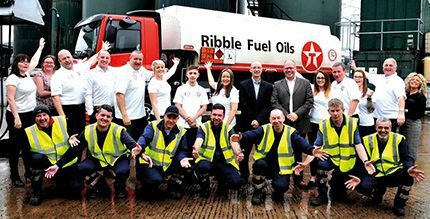 Texaco-branded Ribble Fuel Oils supplies customers in the Granada Television area which includes the South Lakes, Lancashire and Cheshire. In addition to the main depot, trucks are based in Southport, Stanlow, Bramhall and Manchester Fuels terminal. There are 21 drivers across the fuels and lubricants businesses. Operating 20 tankers, usually Magyar-built on a DAF chassis with MechTronic equipment, with an average age of 5 years, a new six-wheeler – complete with 50th anniversary logo – will join the fleet early next year. “Having this logo builds our credibility and if we get the chance we’ll move into other areas,” said David who sees keeping up with legislation, keeping costs under control and motivating people as the most challenging aspects of fuel oil distribution. “Technology has changed the business – from order entry to email invoicing to direct debit – we’re very streamlined with Fuelsoft. Apart from leaving a delivery note everything is electronic. Ribble aims to deliver within 24-48 hours but, as many in the industry have found, a 48-hour delivery does not always meet with the expectations of the modern and more demanding customer accustomed to ever faster delivery times via the internet. A past president of the Federation of Petroleum Suppliers, David remains a member of the FPS Council and is a Flare member. “The FPS, which has gained a lot of respect from government departments, does much in the background to help fuel distributors. “Recent lobbying relating to NoX emissions and zero tolerance on wet line contamination has led to success for the industry but it’s easy to under estimate just how much work went into creating that success…. Back in the 1980s David was present at Jim Rosen’s well-attended FPS meetings in Ramsbottom. “With Jim being the font of all knowledge you just had to be there,” added David. “I do find the Flare Group meetings to be very informative too and there’s at least one presentation at each meeting. We may all buy, sell and deliver slightly differently but we have a very open working relationship with each other. In developing the business, David is assisted by a management team which has set him free to develop other areas. Having turned 50 last month, he expects to have retired by the reputed petrol/diesel cut off in 2040 but will a third Hodge generation follow in his footsteps? “If the children don’t want to get involved, I will know by then. Deciding to sell a family business is very emotive – it’s like selling your history but you have to look at it cold. “With many people in this business now aged between 55-65 we could see more consolidation although there doesn’t seem to an appetite to buy presently…. “Whatever energy is used we need to look at cradle to grave. Anyone with a Euro VI engine is not polluting and with a little bit of bio and a little bit of hybrid, fuels could be here for longer. To celebrate the 50th anniversary, a summer ball was held at the Farington Lodge Hotel which the company’s 56 staff together with customers and former members of staff all enjoyed. “The future of the business is in the next generation – the millennials whether that be family or others. We’ve got young staff coming through including an apprentice in transport.